Michelle Belanger, frontwoman for Mystery Hillbillies, on stage. Mystery Hillbillies are a band of misfits. The band is frontwoman Michelle Belanger and a rotating cast of “sidemen.” The group plays a wide range of music, including country, western swing and blues from the early 1940s to today. 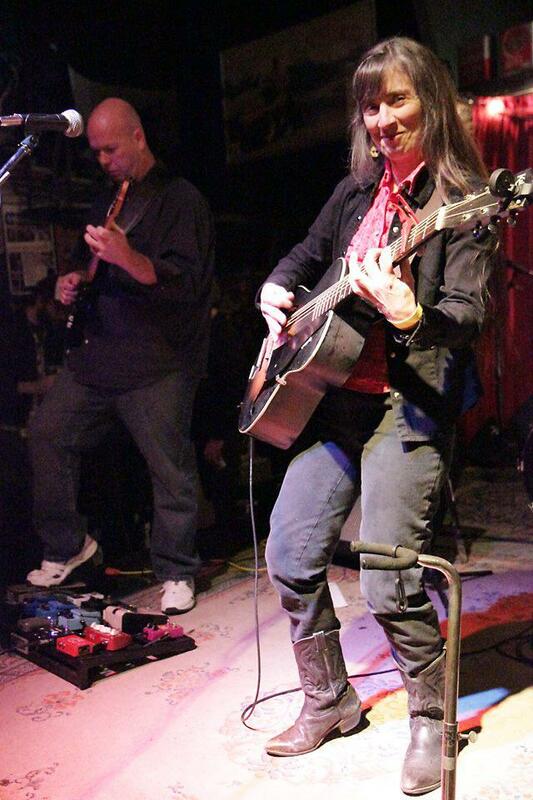 Host Frank Stasio talks with vocalist and guitar player Michelle Belanger who fronts the band Mystery Hillbillies. Guitarist Lance White and bassist Colby Jack join her for a live performance. Belanger started the band with three sidemen as a way to find her musical voice. It eventually became difficult to coordinate everyone’s schedule for gigs, so she decided to open up the ranks of Mystery Hillbillies. Belanger talks to host Frank Stasio about her musical history and approach to engaging with the audience. Hillbillies Colby Jack on the bass and Lance White on guitar join her for an in-studio performance. They will be performing at The Kraken in Chapel Hill on Friday, Feb. 1, and at The City Tap in Pittsboro on Saturday, Feb. 9.